The various trademarks that were filed for G1 Littlest Pet Shop provide a great deal of information on Kenner's merchandising intentions, etc. They additionally provide a more "official" timeline for LPS. All of the information below is featured publicly at Trademarkia. "On Monday, November 25, 1991, a U.S. federal trademark registration was filed for LITTLEST PET SHOP by Hasbro, Inc., Pawtucket, RI 02862. 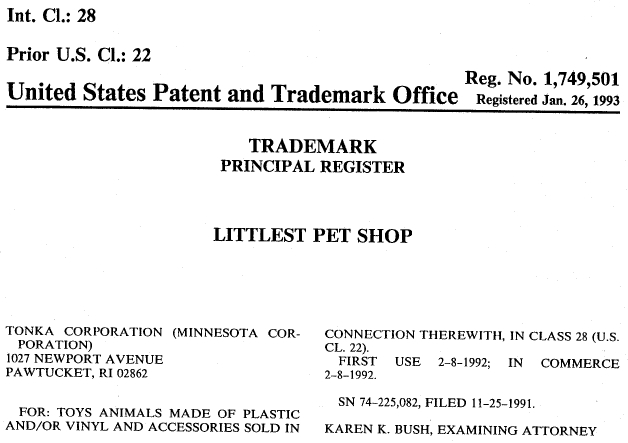 The USPTO has given the LITTLEST PET SHOP trademark serial number of 74225082. The current federal status of this trademark filing is CANCELLED - SECTION 8. The correspondent listed for LITTLEST PET SHOP is Paul N. Vanasse of Hasbro, Inc., 1027 Newport Avenue, Pawtucket, RI 02862 . The LITTLEST PET SHOP trademark is filed in the category of Toys and Sporting Goods Products . The description provided to the USPTO for LITTLEST PET SHOP is toys animals made of plastic and/or vinyl and accessories sold in connection therewith." Last Applicant Owner: Hasbro, Inc.